An event that starts with Anna Wickham’s words is going to have a head start in my world. I can always rely on festival director Matt Holland for this. Matt walks around with her words in his breast pocket, and in his head. Till we don’t know what to do! And pray for the end of life. 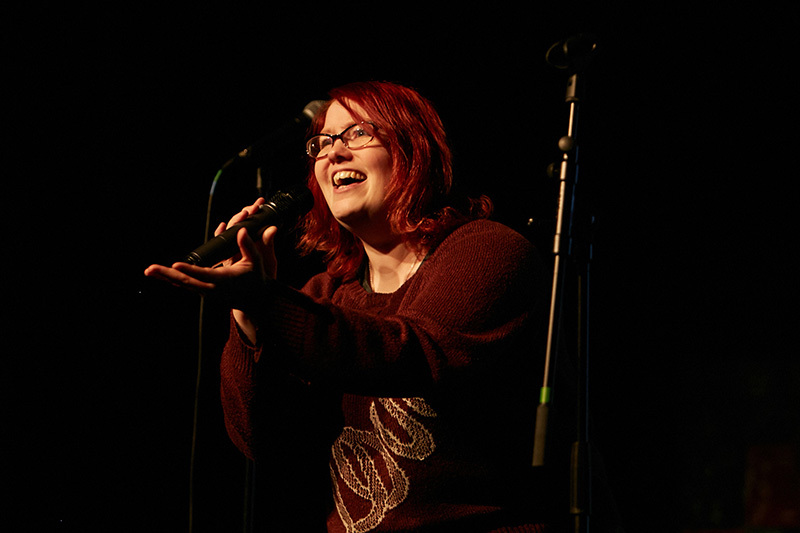 “Poems are no longer dangerous enough; risk-averse…” shouts Brenda Reed Brown, Swindon Slam contestant. And, as the evening comes to an end, I must agree she may have a point. For the 25th anniversary of the Festival of Literature (and the 22nd Swindon Slam) previous winners – normally excluded from entering – were invited back. That was good news for 2017 winner, Joy-Amy Wigman, who took the 2018 trophy with her poem, Hell Is Empty; a political poem documenting an encounter that Joy had with a Tory MP who advised ‘disability cuts will not affect you’. This statement promoted her pennings and sign off – it will affect you, maybe not, you are a Tory. Andra Simons blew me away. The last poet to read at Poetry Swindon Festival – poetry was actually banned after him – and it felt a fitting send off. “I heard him and thought he was special and wanted to share him,” said director, Hilda. This is the job of an artistic director as far as I’m concerned – to have impeccable taste. Andra is from Bermuda; he yelled, he repeated words into a rhythm, he smeared facepaint all over his poetry film, he mentions LGBT issues, and showed his love for his mom. It is the final day of Poetry Swindon’s festival. For an entire week, I have stood silently in the Tent-Palace of the Delicious Air, watching and listening as poets spin colours from words. Now I leave my china body and send my spirit out across the festival. I am in the Richard Jefferies Museum. Daljit Nagra’s masterclass has begun. There is a fine table covered in sleek green leather. Daljit sits at one end, like a friendly teacher. Like a friendly headmaster. Some of the students are established poets. Others are relatively new to the poetry world. One, in particular, feels like a pretender. The word “master” is not a term he identifies with. Right in front of my face and it’s poetry. I’ve lost my bloody hat but in the grand scheme of things who cares? Writes Domestic Cherry veteran Barry Dicks from his surveillance vehicle. I had it when I was installing my CCTV in that psychedelic tent of theirs. I’m over the road, the Texaco Garage, in Roy’s van. I’m in the back with my bank of 3 widescreen Bright House tellies, one blinking like a Belisha beacon. I am the wastepaper basket under the desk of a tired poetry competition judge and I’m full. I’m waiting for the black bag to come again to release me from this heavy weight of 40% hope and 60% despair that has me brimming over. But this time it’s different, I can sense a poem being uncrumpled, flattened out and reconsidered. It is, of course, the winning poem and I am glad to give back for once.